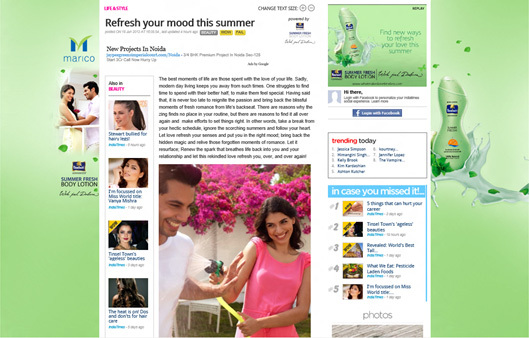 Marico created a sponsored article integration on Indiatimes Life & Style for its Parachute Summer Fresh Body Lotion. I discovered the integration couple of weeks back when the brand also executed a home page takeover on Indiatimes. The publisher had a prominent lead-in to the article from its home page Top Story carousel. The article page was fully branded with a skinner, ad unit and sponsor logo presence. The article was in line with the product communication of 'refreshing love in summers' and creating magical moments together again (woh pal dobara being the campaign tagline). I do have issue with the copy on the article, which didnt' say much – it could have been so much better. Content gripes aside, this is a great integration idea for launches and topical campaigns. It engages users that opt to consume the content and helps brands tell their story. We just need to execute these better.